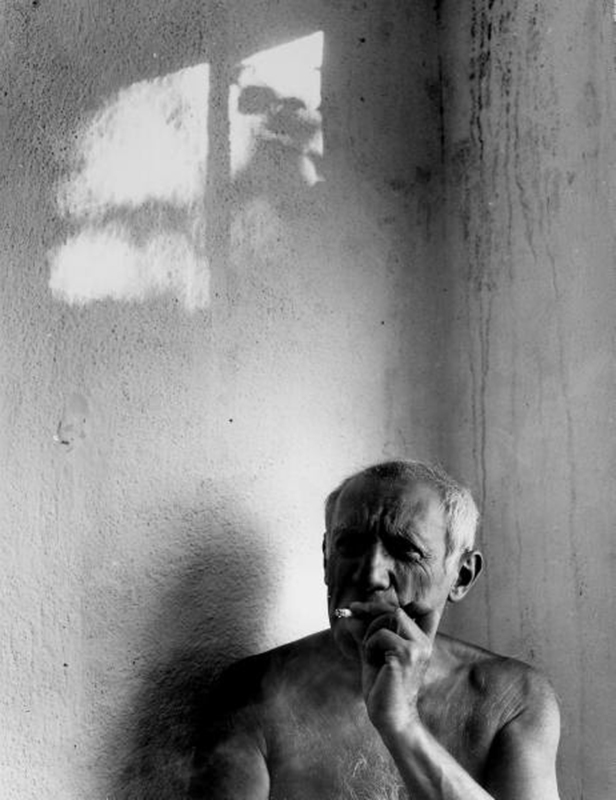 Time could truly be made to stand still. 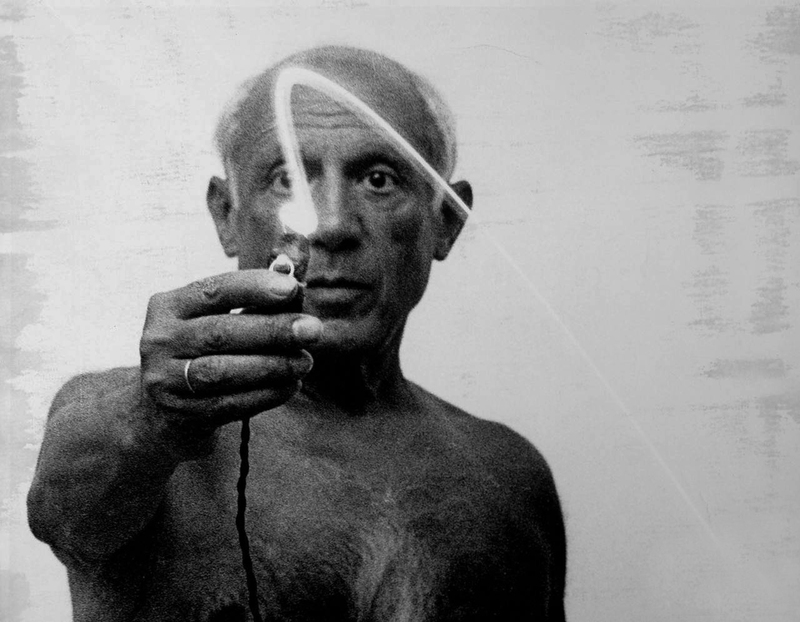 Texture could be retained despite sudden violent movement. In 1949, Albanian-American photographer Gjon Mili was able to make an appointment with Pablo Picasso at his studio in Vallauris France. 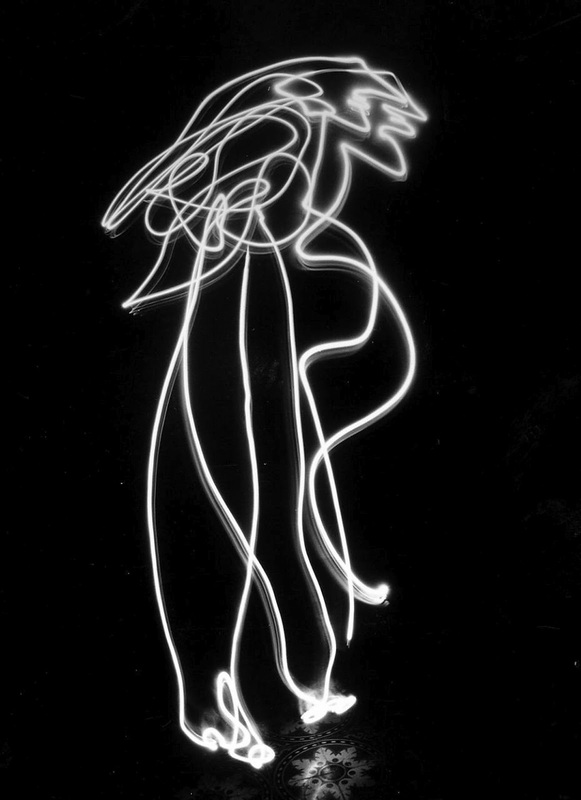 Trained as an engineer and self-taught in photography, Gjon Mili was the first to use electronic flash and stroboscopic light to create photographs that had more than scientific interest. 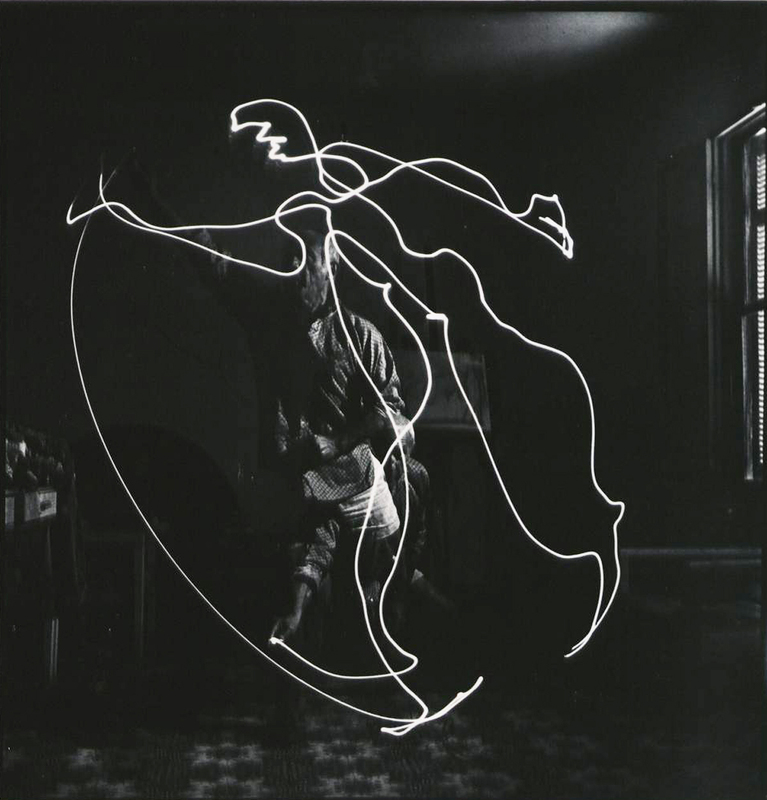 Gjon Mili would visit Picasso twice over a long duration of time and on both occasions, while assigned to photograph the artist, he found himself involved in totally unforeseen creative experiences. 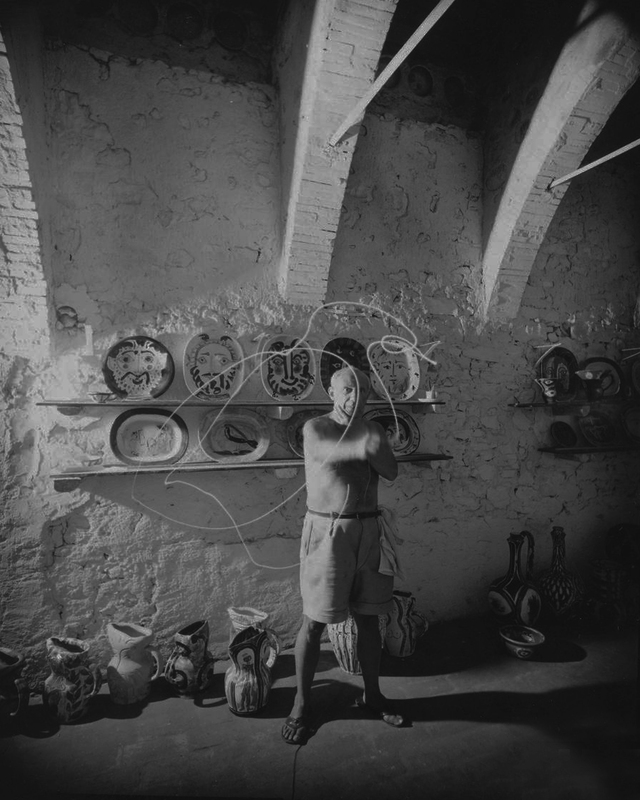 One result of the first meeting, at Vallauris in 1949, is the photograph of Picasso drawing the Centaur with a "light pencil". This spectacular "space drawing" is a momentary happening inscribed in thin air with a flashlight in the dark – an illumination of Picasso's brilliance set off by the spur of the moment. 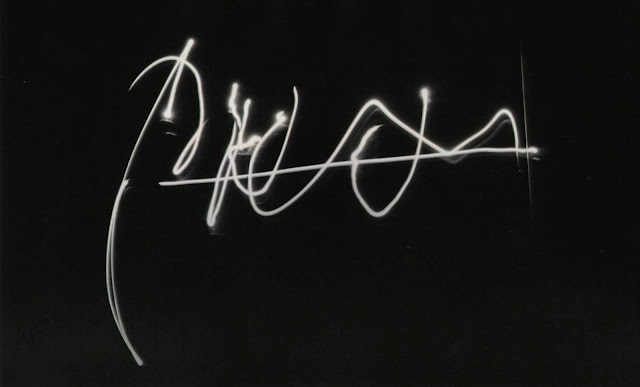 It was during this first visit in 1949 that Gjon Mili showed Pablo Picasso some of his photographs of light patterns formed by a skater's leaps – obtained by affixing tiny lights on the points of the skates. 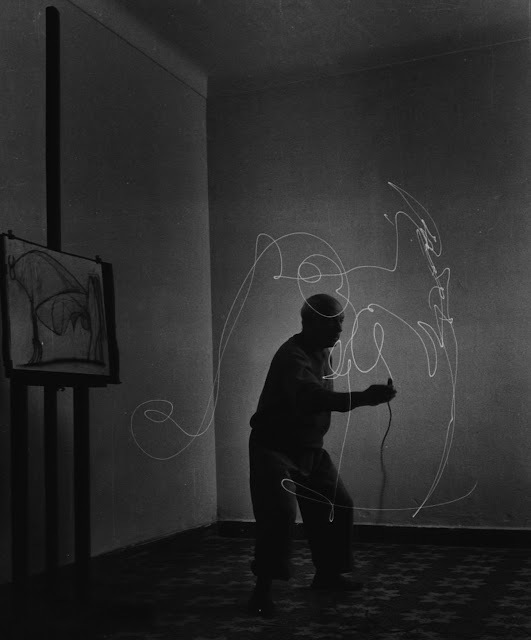 Picasso reacted instantly. 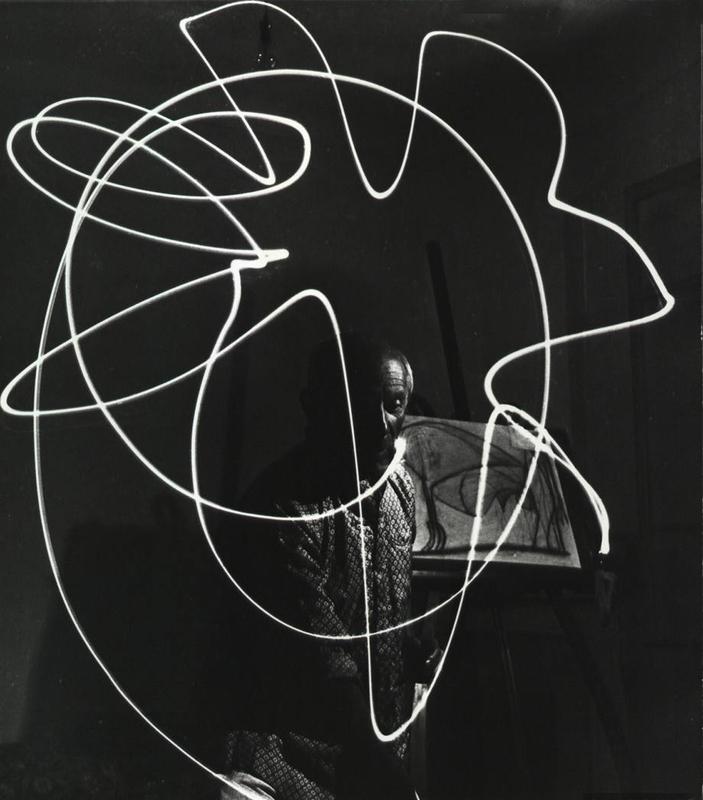 Before Gjon Mili could utter a word of explanation, Pablo Picasso, sparkling with excitement, started tracing through the air one intriguing shape after another with his bare finger. 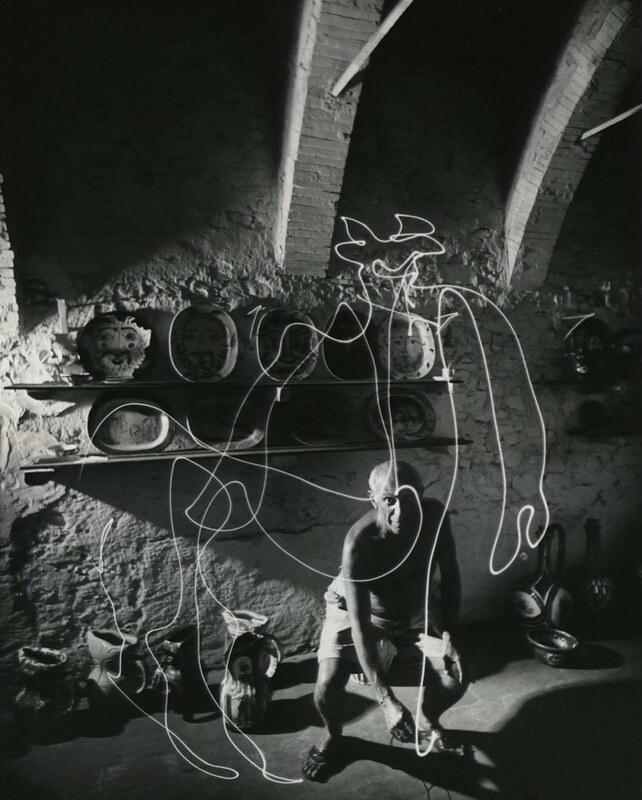 It is interesting to note the affinity between Picasso's first light image, the Centaur, and the shape of his own crouched body as he starts to draw. 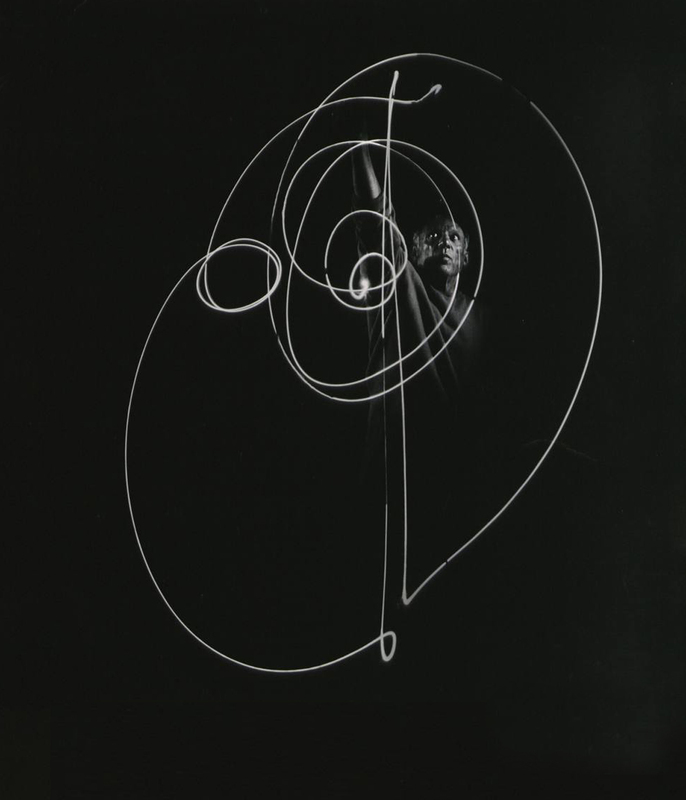 Significant, too, is the course of his action as the image progresses from beginning to end. He first describes a small hook and swings upward to delineate the left arm, then the head and horns, the right arm and then the spine; at frantic speed – which is shown by the thinness of the line – he scribbles two wavering hind legs before he slows down, almost to a stop, while drawing the soft curve of the underbelly. As if he suddenly remembers there is more to do, he swiftly shoots straight up to fill in the facial structures and without breaking the flow, signs off with a flourish. 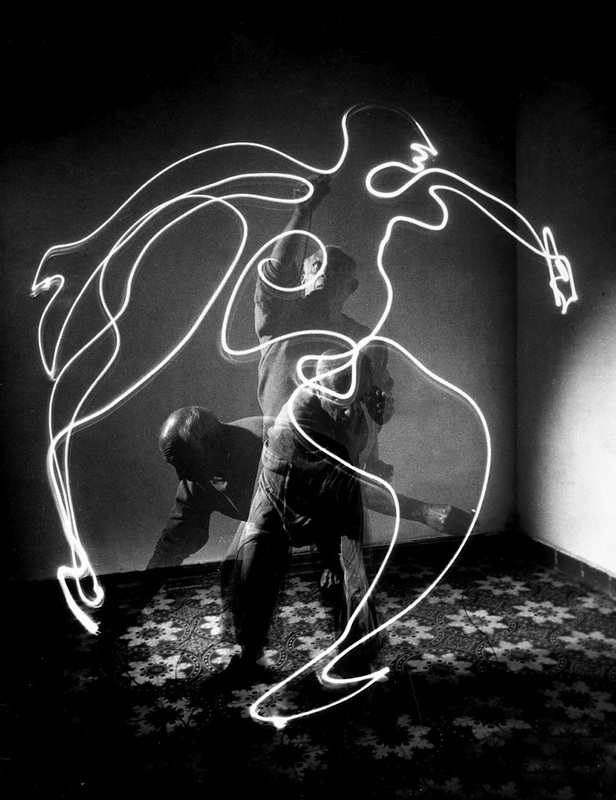 The photographic effect was created by opening the camera’s shutter while Picasso was in the dark, crouched over to begin his instant masterpiece – this static pose captured by a momentary flash. Again in darkness after this instantaneous flash of light, Picasso quickly draws his signature image in the air with a "light pencil". 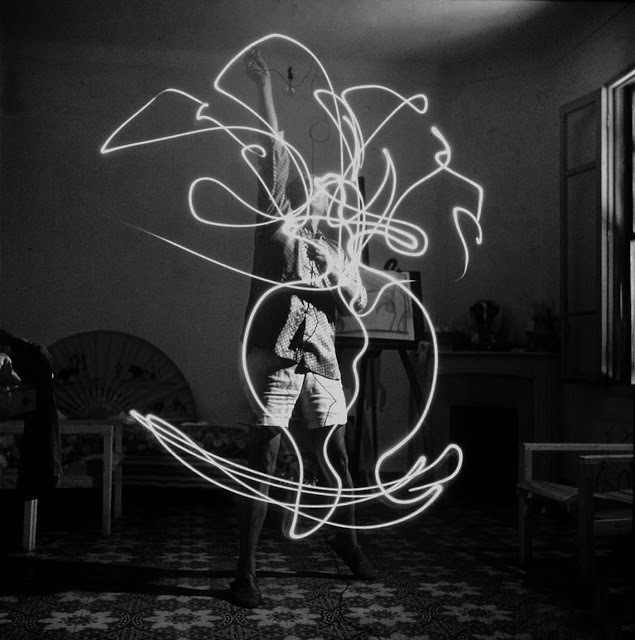 This light drawing is an "instant Picasso" – vanishing no sooner than born, except for what the camera captures. Not unlike a doodle in appearance, this rendering is an unimpeded expression of the artist's inner vision, and as instinctive as one's gesticulations in trying to make a point. 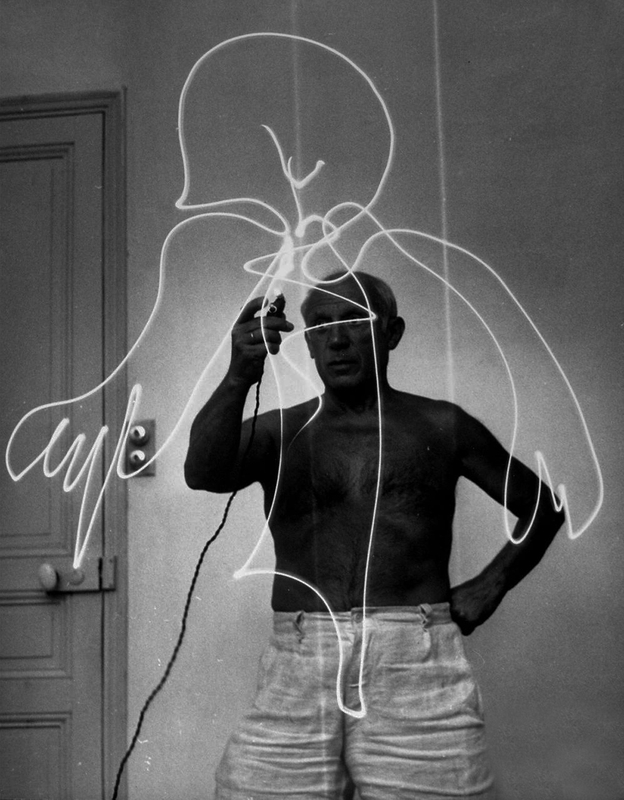 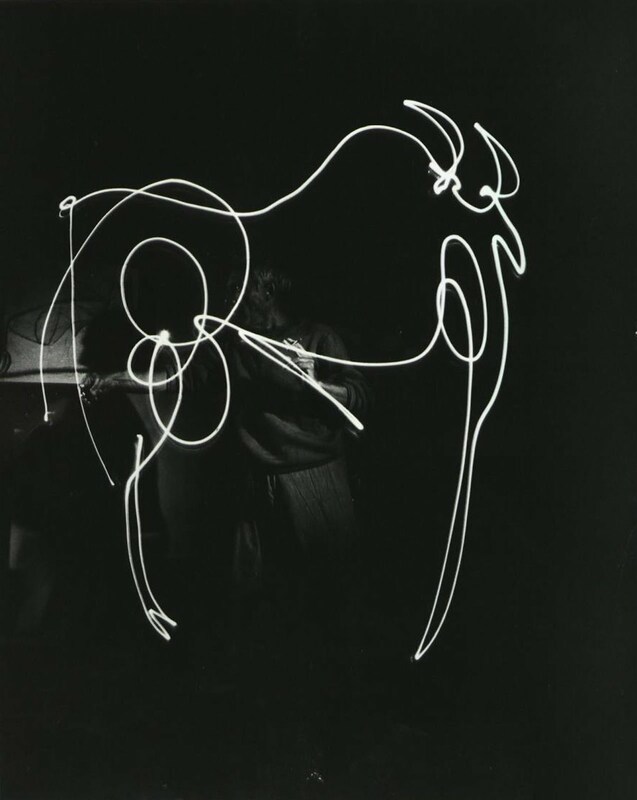 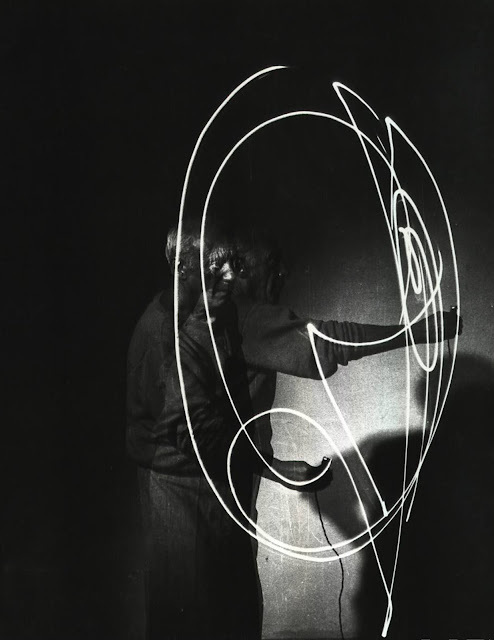 Pablo Picasso's light drawings highlight better than anything in clay, wood, metal, or paint the automatic link between hand and brain which is basic to Picasso’s creative thrust.